MySwedish is your free, online learning tool for the Swedish language. Follow MySwedish on Facebook and Medium or say hello. The main motto of MySwedish is study with pleasure and joy. We believe and we actually know that learning languages is fun. 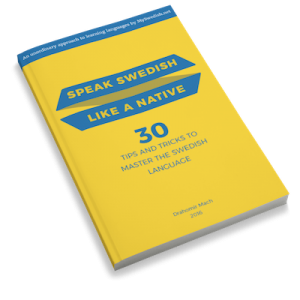 There is more than 50 free online lessons on MySwedish, daily language-related posts on our Facebook site, e-books and a possibility to book an online lesson with a native Swede. MySwedish is a living system that is constantly growing. We try to utilise all the popular language learning services. We have our own classroom on Duolingo. We have created many lessons on Memrise and we have our own lessons on our website. We have our own MySwedish club on Duolingo where the best students compete to be the winner of the week. Do you want to be in the club? Send us a message to get the access code. There are more than 50 free online lessons on MySwedish. There is no need to follow the order of the lessons you can start wherever you want to. Study with pleasure and joy. We are making it as easy as possible to study Swedish. There are more than 20 vocabulary-building lessons on Memrise and we are adding new vocabulary lists regularly. We are proud to introduce are new and awesome feature. You can have a one-on-one online lesson with a native speaker. All you need to do is to book a time that suits you and the tutor. Book your time today and become fluent in Swedish even faster. Making our students happy and provide them the best possible experience is very important for us. Find below what people who use MySwedish say about our services. I really enjoy reading your web page! Your personality comes across and it feels as if a friend motivates you to study. Great job! Denna sida är jätteintressant. Det är kul att lära sig Svenska här. Thank you so much for these lessons. Most helpful and informative.